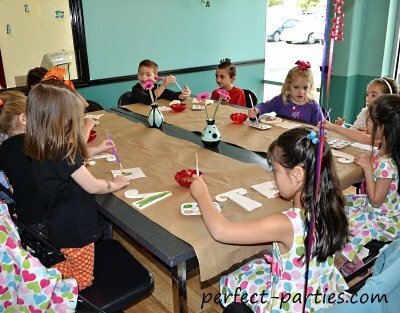 Kids pottery parties are a cute hosted opportunity for all ages. Many have special packages for birthday celebrations and a separate party room just for the event. Many require a down payment that may be non-refundable after a certain time frame to hold the date, so make sure to confirm with your guests to get a head count. Book early so you can change the date if necessary and have the time selection you want. Most will recommend selecting pieces ahead of time to ensure availability. You can choose a theme of your choice to go along with the party. Our girls selected Angry Birds as their main theme and we decorated the room with balloons and cute favors. Be sure to give time to reply and require a RSVP by a certain date so you can select pieces to paint. Also, if you require the children to bring or wear a specific type of clothing such as a smock or t-shirt especially for very young children, be sure to notate it on the invitation. Be sure to specify if you want parents to stay and help supervise or if they may leave. The three I called has a designated host from the company who will instruct the children throuhout the whole process and will stay in the room during the party to assist in any way. Set up a table with colorful napkins, plates and cutlery. You can find themed party decorations and paper goods at Birthday Express. Click the button to see some! 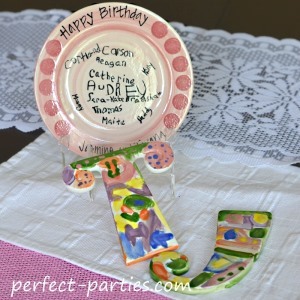 Select pieces ahead of time for your kids pottery party. This will ensure they are available and you know the cost per piece. Pieces will be fired after the party and a time needs to be scheduled to be picked up by you or the parents. Choose your pieces ahead of time and consider gender and cost or at least a second option for those who may have already come before and done that piece. One child made her last initial since she had already done her first. Help monitor the activity so children stay seated and follow directions. Consider age group coming because it is a primarily sit down birthday party. You don't want children wandering around outside of the party room due to the delicate pieces around the store and for safety reasons. Arrange for pick up of the pieces. Either have parents pick up after being fired or pick up all and deliver at school, church etc. I found it easier to deliver to make sure each child's piece was picked up.